5.8GHz 802.11 a/n/ac Indoor Amplifier (4 Watts saturated). A highly linear amplifier with Max saturated output of 4 Watts designed for indoor applications. 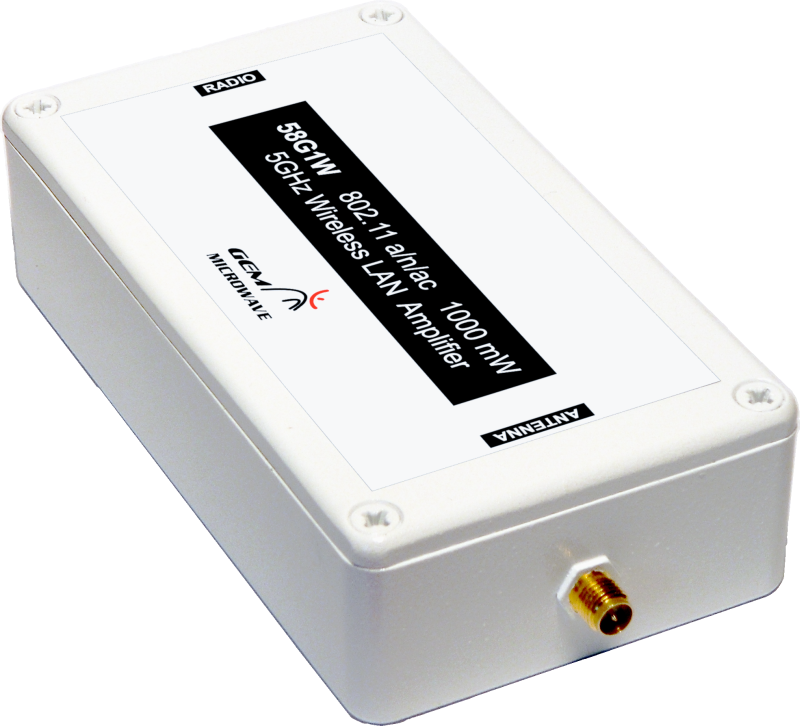 This 5.8 GHz bi-directional amplifier is designed for 802.11a radios or any OFDM radios in 5 GHz band. Since the 64-QAM modulation requires highly linear mode of operation, this amplifier delivers max of 1000mW power with all 802.11a or similar radio equipment. For FM, AM or other modulations schemes the unit delivers up to 4000mW output. Also available in completely sealed, weatherproof version for all outdoor applications. • Transmit Gain: The unit provides highly linear gain of 15dB and full saturated output power of 36.0dBm. • LNA: The built-in Low Noise Amplifier with signal gain of 12dB improves the receive sensitivity of remote equipment, while keeping noise level very low. • Receive Filtering: All radio equipment contain filter for receive path. The band pass filter on this amplifier gives added protection against out of band noise. • Warranty: All GEM Microwave's products come with 1-year warranty. Copyright © 2006-2019 GEM Microwave. All Rights Reserved.